This is what everyone cares about the most, right? At the end of the day, you want to know what the move abroad will cost you. Some quotes just have one price displayed while others have multiple prices shown. We’ll walk through a few examples. This quote shows 3 price options based on the mover’s estimate that you’re moving 400 cubic feet of stuff. The first price ($4,524) is the cheapest because the mover is going to put your stuff in two wood crates (also called lift vans) and they’ll sit around a warehouse until there’s enough stuff from other people to consolidate in a shipping container. While it’s the cheapest, the delivery time could be the longest since it may not ship right away. We’ve seen shipments sit around for months before there’s enough to consolidate into a container. For the second price of $5,616 your stuff will still go in crates but won’t wait around to be consolidated. The final price assumes you have more stuff than estimated and will fill a whole container. This quote shows one price, which is based on the mover’s estimate that you’re moving 20 cubic meters (Cbm) at a net weight of 4500 pounds. The “20 ft via FCL” means it will be a Full Container Load using a 20’ long container. Full Container Load means your stuff takes up the entire container so you don’t have to wait around for other peoples’ shipments to fill it up. If you were going to try to compare quotes between the two movers, this one is most similar to option C in the first example. People moving abroad often focus only on price. That’s understandable given how expensive moving overseas can be, but you must understand what services are actually being included in that price. Otherwise, you may book a mover that seems cheaper but is actually more expensive when you realize all the extra services you’ll have to pay for. Each mover should list out in the quote exactly what services they’ll provide. If they don’t, ask them to provide it to you in writing. This section lists all the things included in the price. Notice how they bolded Terminal Handling Charges and port fees? Many moving companies don’t include this so they look cheaper on paper. But these fees can be several hundreds of dollars and are one of the most common surprises expats get from “cheaper” movers. Here’s an example of what services are included from another quote for the same move. You’ll see the included services are very similar although the language used is different. Note that with both quotes if your destination home is higher than the second floor and there’s not an elevator there will be additional charges. It’s just as important to understand what services are excluded from the price. Most quotes will have a section that clearly lists what is not part of the cost. There are standard exclusions that will be common across all quotes. “Difficult access” is a catch-all term for how difficult it is to access either the origin or destination home. For example, if the street is too narrow for a moving truck and the crew has to park around the corner and then carry your things to the truck, that’s considered “difficult access” and you’ll be charged more. These are the things the mover should identify during an in-home survey, however, so you should know in advance whether you’ll have additional charges. 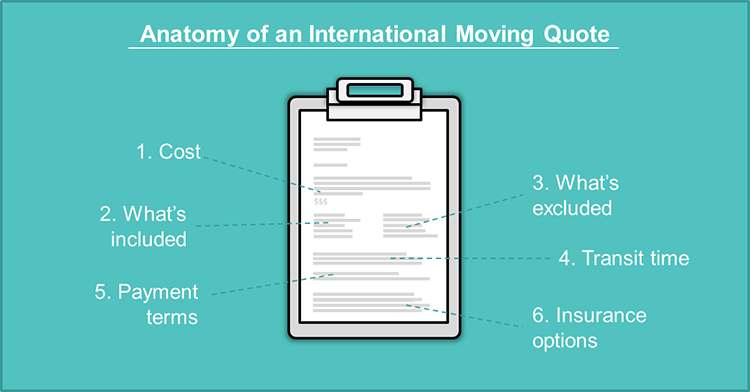 You can learn what the other terms refer to with our international moving guide glossary. How long will it take your stuff to arrive? Weeks? Months? This is something you definitely want the mover to show on your moving quote. Remember that first example that showed three price options? This image shows how long each of them will take. The gamble with a consolidated service is that it could be just as fast as the other options…or it could be a lot slower if it ends up sitting around in a warehouse for a while. Some moving companies estimate the transit time in days, some in weeks. Some movers don’t list any transit time on their quotes. If they don’t, you should request that information in writing. Note that transit time isn’t binding – there’s not much recourse you have if the shipment is late – but it at least gives you an idea of how long each mover will take. Additionally, some movers may be able to give you an exact date your shipment would sail if you book with them. All quotes should have a section indicating the payment terms. As shown in the example below, there’s usually nothing special to look for. However, some movers will charge you a service fee if you pay by credit card. And some will say the quote is only valid for a certain period of time (typically 30 days). Some may also require a deposit when you book them, though it shouldn’t be more than 5-10% of the total price. All movers will require full payment after they pick up your stuff, but before it actually gets shipped. Insurance (sometimes referred to as Transit Protection, as in these examples) is almost never covered in the cost of a quote. Movers will offer it, generally through a third party insurance company, for an additional cost. 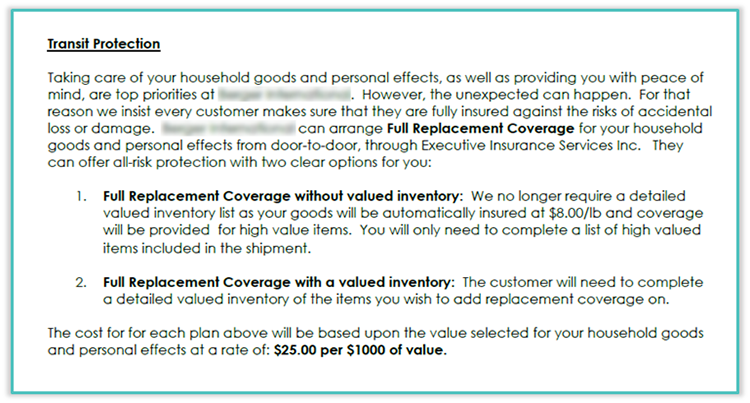 In Example 1 above, you see that “Full Replacement Coverage with a valued inventory” is available for $25 per $1,000 of value. So if it would cost $10,000 to replace all your stuff, then insurance would cost $250. 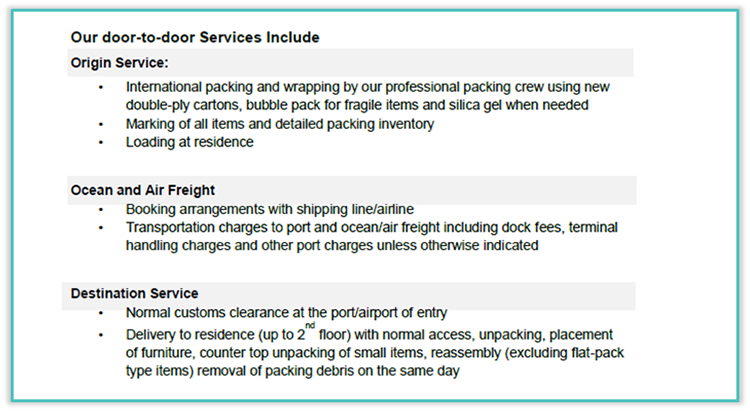 In Example 2 the cost is $27 per $1,000 of value, so it would cost $270 to insure your shipment.